When all else is equal, what makes one greater than the rest? I ponder this question as my cousin, She Clooney returned to Vancouver with her husband, Alaskan Brewed, in tow. They wanted oysters and I suggested a place on Commercial Drive but was vetoed. All they wanted was to head back Rodney’s in Yaletown and sit at the bar. They have done this on every trip to Vancouver since 2007, as long as time permitted it. Perhaps it’s tradition but they argue Rodney’s is one of the favourite places for oysters. So what makes Rodney’s better than all the other oyster places in the city for them when other places offer similar price, varieties of oysters and shucking skills? For Clooney and Alaskan Brewed, it’s the human touch and the ambience created by the crew that man Rodney’s bar. From the old school upbeat rock that’s piped into the restaurant to the playful interaction between the male staff, once seated you feel like you have been welcomed into a boys’ clubhouse. The staff warmly greet everyone who saddles up to the bar. If you chat with them, you will get stories about motor cycles, inside jokes explained, tips about destinations in Vancouver to see (meant for Cloney & Alaskan Brewed) and of course expert advice on the oysters they are serving that day. Now this fun atmosphere wouldn’t mean much if they didn’t have good food and oysters. For our visit we order two dozen oysters and 2 steamers. Expertly shucked, the oysters were presented with 5 different sauces (ranging from mild to super spicy) and horseradish. My cousins were in oyster heaven. For me I stuck with the vinaigrette (purple jar on the far left) and just a touch of horseradish. I though the Kusshi had a nice sweet flavour with clean finish. The royal miyagi had a creamier flavour. The Kaipara and Shikgou were overwhelmingly briny and as I result I didn’t like them as much. 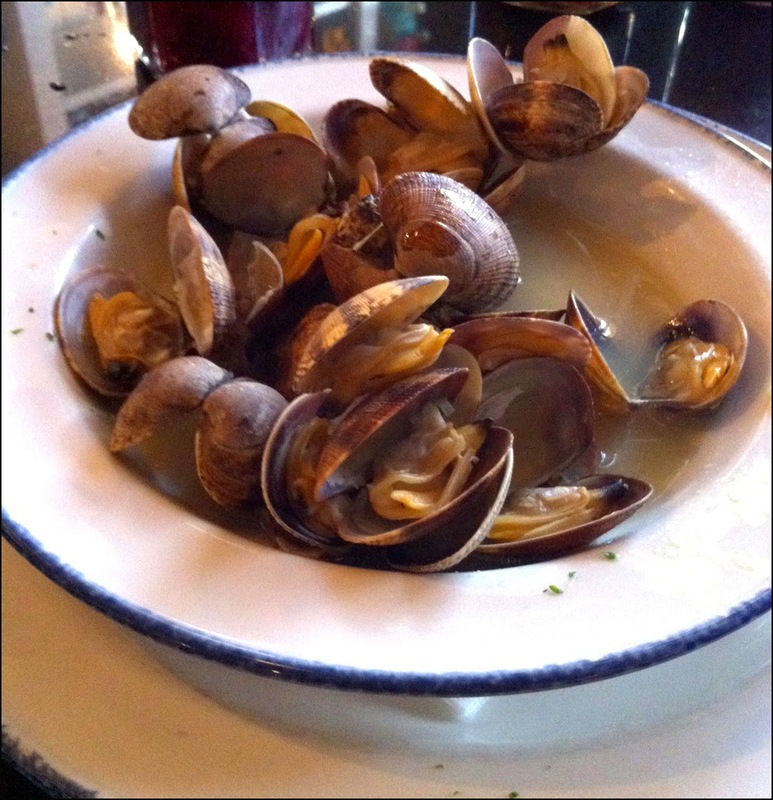 For our 2 steamers, we got mussels and clams. Out of the 2 bi-valves I liked the mussels more as they were more plump and juicy. I think Clooney may have asked the crew to toss some wine into the mussel steamer and not the clam one. The leftover mussel juice was much more flavourful and complex. I would have been a happy camper if all I ate was the complimentary bread soaked in the buttery, salty and yet slightly acidic mussel juice at Rodney’s. It was addictively tasty. Although I didn’t grab a photo, another must order at Rodney’s is their Caesars. They throw a little more worstershire sauce into their blend than most places and the drink is tastier for it. Overall Rodney’s is a fun and relaxed place to have excellent oysters in the city. If joking around with the staff is not your thing to do, then I would suggest asking to be seated at a table instead. However, if you like to chat and tell stories then the bar Rodney is definitely the place for you.